Twitter/ The Blue HouseSouth Korean envoy has dinner with Kim Jong Un (C), his wife Ri Sol Ju, and his sister Kim Yo Jong. North Korean leader Kim Jong Un said he wants to advance inter-Korean relations and “write a new history” of unification. The comments were made on Monday evening to South Korea’s envoy to Pyongyang, the first time officials from the South have met with Kim. A “satisfactory agreement” was also made between the two sides. It is unclear what the deal was about, but it likely points to a future inter-Korean summit with the heads of the two countries. South Korea’s chief envoy, which was hoping to broker US-North Korea talks, will soon fly to Washington to brief President Donald Trump and senior US officials. The North’s state-run newsagency KCNA also reported that Kim made clear to the envoy his “firm will to vigorously advance” inter-Korean relations. This was the first time South Korean officials have met with Kim Jong Un and the 10-person envoy, led by the South’s national-security adviser Chung Eui Yong, spent four hours and 12 minutes at a meeting and then dinner with Kim. 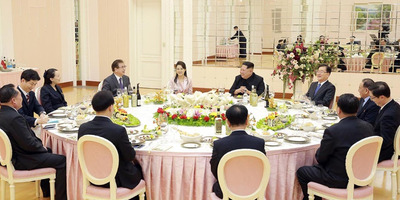 The dinner was also attended by Kim’s wife Ri Sol Ju and his sister Kim Yo Jong, who was responsible for inviting South Korea to Pyongyang during the Winter Olympics. Both the meeting and dinner took place at the headquarters of the North’s ruling Workers’ Party, the first time South Korean officials had visited the building, Yonhap reported. Early reports from both South and North Korea indicate some sort of deal was reached, but details have yet to be confirmed. “Hearing the intention of President Moon Jae In for a summit from the special envoy of the south side, he exchanged views and made a satisfactory agreement,” state-run KCNA reported. While the South said its envoy would deliver a message about denuclearizing the Korean peninsula, there is very little chance this was what was agreed to. It seems more likely that a letter from South Korea’s President Moon and delivered by the envoy proposed the early stages of an inter-Korean summit. If the two leaders were to meet for a summit, it would be only the third such meeting between the two countries. Kim ordered that the North would “rapidly take practical steps” regarding the letter. He also raised the issue of “easing the acute military tensions” on the Korean Peninsula, which has long been a frustration to the North. Once the Paralympic Games end in March, the US and South Korea are expected to resume military exercises which, in the past, North Korea had a tendency to respond to with missile tests. South Korea hoped to broker dialogue between the US and North Korea at the meeting. After the envoy returns home on Tuesday Chung will head to Washington to reportedly brief US President Donald Trump and others senior US officials.